Zone 1 is the area of maximum modification and treatment. It consists of an area of 15 feet around the structure (measured from the outside edge of the home's eaves and any attached structures, such as decks or nearby trees). Plant nothing within 3 to 5 feet of the structure, particularly if the building is sided with wood, logs or other flammable materials. Decorative rock, for example, creates an attractive, easily maintained, nonflammable ground cover. If the house has noncombustible siding, widely spaced foundation plantings of low growing shrubs or other "fire wise" plants are acceptable. Do not plant directly beneath windows or next to foundation vents. Zone 2 is an area of fuel reduction designed to reduce the intensity of any fire approaching your home. It is a transitional area between Zones 1 and 3. 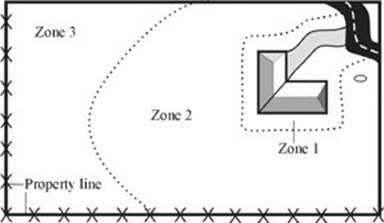 The size of Zone 2 depends on the slope of the ground where the structure is built. Typically, the defensible space should extend at least 75 to 125 feet from the structure. Within this zone, the continuity and arrangement of vegetation is modified. Remove stressed, diseased, dead or dying trees and shrubs. Thin and prune the remaining larger trees and shrubs and ensure adequate spacing. Remove ladder fuels. Be sure to extend thinning along either side of your driveway all the way to your main access road. Zone 3 is an area of traditional forest management and is of no particular size. It extends from the edge of your defensible space to your property boundaries. Thin forest trees so that crowns are separated by at least 10 feet, prune trees to a height of 10 feet and prevent ladder fuels from developing. Occasional dead trees for wildlife are important, but accumulations of dead woody material on the ground and/or dense logging slash or patches of dead trees should be kept to a minimum. Important Note: if the recommended distances go beyond your property boundaries, contact the adjacent property owner, and work cooperatively to create defensible space. The effectiveness of defensible space increases when property owners work together. Do not implement defensible space practices on neighboring properties without first securing permission. The San Bernardino County Assessor's office can provide assistance if the owners of adjacent parcels are unknown to you at www.sbcounty.gov/assessor or call 909-387-8307.